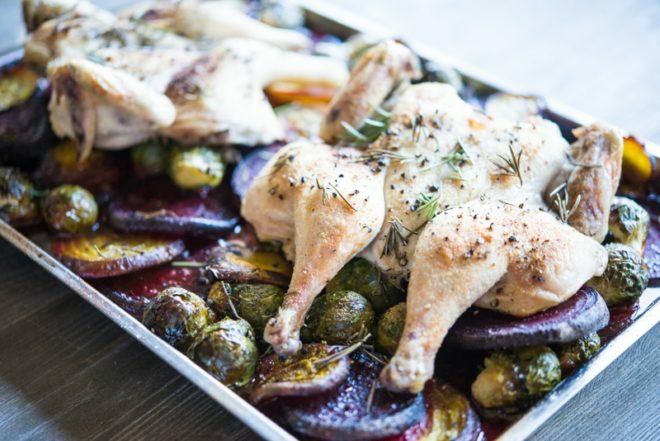 This spatchcock hen sheet pan dinner will get a healthy, balanced, flavorful meal on your table using just one sheet pan! I want to start off today's blog post with a personal blogging vow. 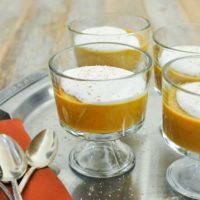 You see, when I *first* started my blog in 2011, I shared a bunch of personal stories with each recipe post. 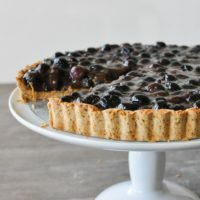 As my blog evolved over the years, I thought that maybe I'd try to keep things here more recipe-centered while reserving my personal stories for social media. WELL, I'm coming full circle, y'all. I miss blogging about my life! I miss including you via this long-form written word. So, I'm back. 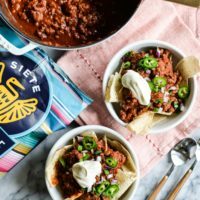 My December 2016 blogging vow is that with each recipe post, I will share one personal story. It may be about the fact that I don't have a single ornament on my Christmas tree (which I'm loving); it may be about the tiny little woodland creature I brought into my home and then named Tom; or it may be about the terrifying, humbling, thrilling adventure of re-launching the Project Online. In any case, it'll be from the heart and hopefully entertaining. TODAY, I'd like to talk about my Christmas tree. Does anyone else feel the Christmas tree decoration pressure? Because I DO. When Austin (my husband) and I moved into our current home about 2.5 years ago, I spent my entire new home decoration budget on key pieces of furniture. Investing in long-term furniture pieces that we LOVED seemed like the logical thing to do! Then, when the holidays rolled around, I had little-to-nothing left for festive add-ons. I vividly remember his mom gifting us her old tree, which was very nice and probably out of pity. That same day (December 20th), the two of us fled to Walmart to pillage the then-discounted Christmas ornaments. We went home with two HUGE boxes of smallish silver and gold (to keep colors simple) glittery ornaments, a giant bow for the top (stars/angels were too expensive), and three $1 felt stockings (one for each of us and one for Gus). We decorated our tree, cut/twisted old metal hangers into stocking holders, and felt completely victorious. For our second Christmas in this house, we received a monogrammed tree skirt (from Pottery Barn, they're lovely) and I indulged in some equally lovely Pottery Barn stockings. Our holiday home was getting prettier and more personalized! Now for our third Christmas, I'm ready for new ornaments! But, there's a problem …I don't know how to shop for ornaments. So, our tree is currently sitting in our living room completely naked (save for a few strings of white lights). The issue is 3-fold. First, I really do not want to re-glitter our house with our 250 count 3-year old silver and gold Walmart ornaments. Second, I can't bring myself to spend more than $0.02 per ornament (something I think I may need to get over). Third, when I walk into someone's home with a masterfully decorated tree I'm honestly in dumb-struck AWE. HOW do you DO THAT? I assume it takes years of collecting gorgeous ornaments …but HOW did you tie it all together? Festive, homey, colorful, warm, personal trees blow my mind. Though I'd love to adorn our home with a beautiful, festive, personal-touch tree each year, I wouldn't even know where to start. SO, our tree is naked …and it may stay naked until I can figure it out. Now onto this new dish! Ask and you shall receive! 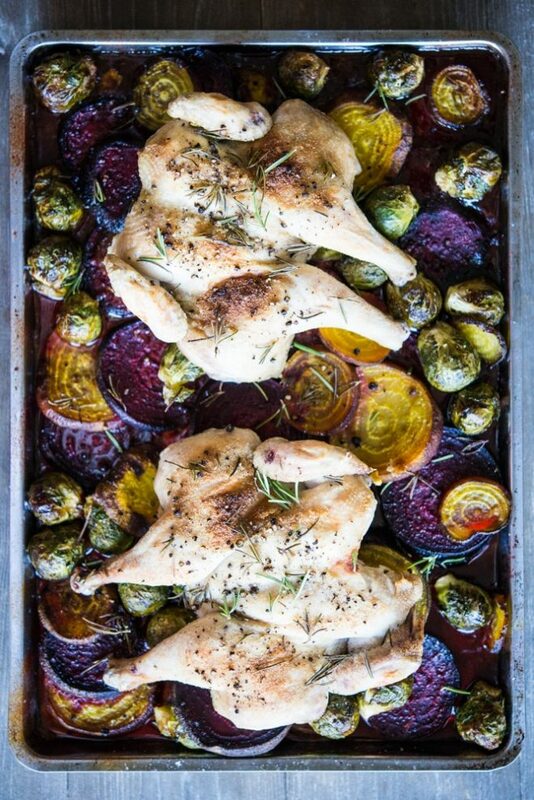 I know a lot of you LOVED this simple sheet pan dinner I posted a little while back. In fact, you've told me that while YES, you love the flavors, you mostly adore it because of the simple preparation. 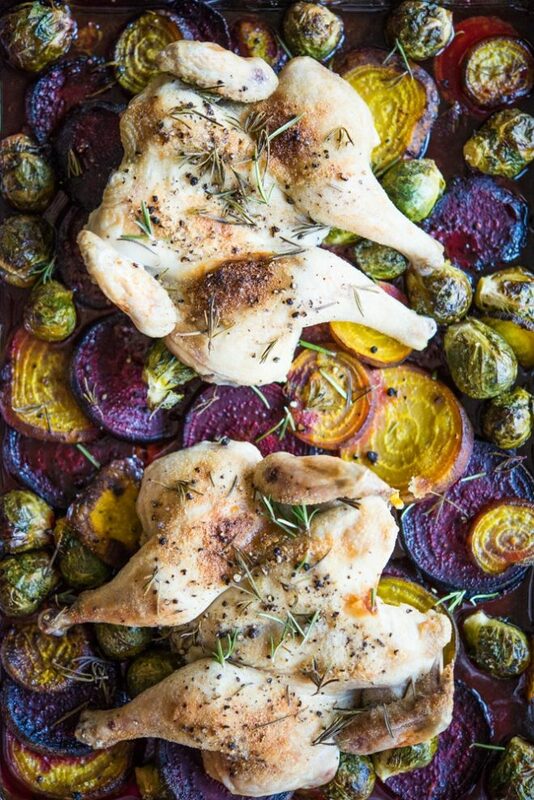 The fact that you only have to get ONE sheet pan dirty in order to put a balanced, tasty dinner on your table is a huge perk. 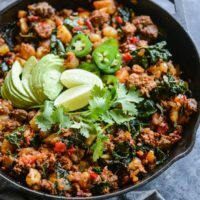 So I went back to the drawing board in an effort to bring you another sheet pan dinner! 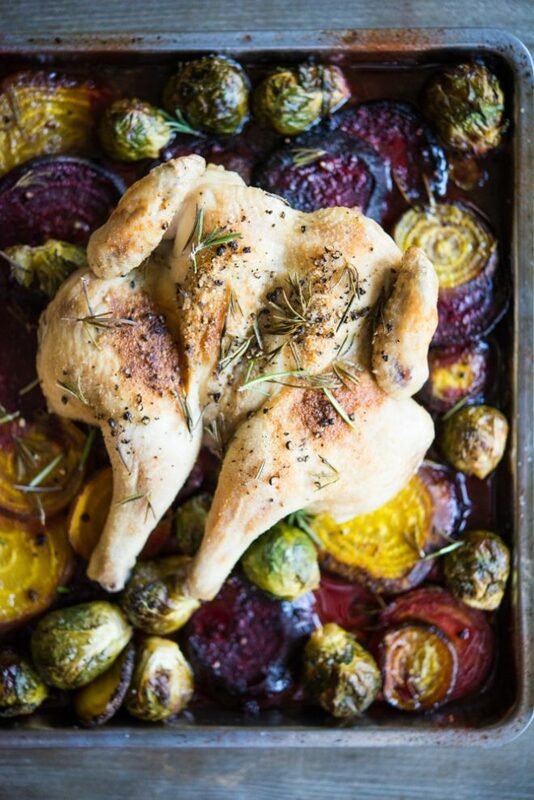 Next up is a seasonal spin on a sheet pan dinner. 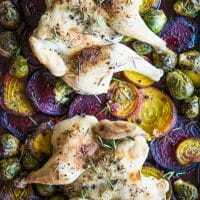 This one calls for game hens (small chickens or even quail could work), Brussels sprouts, and beets. Aside from preparing the hens (which is simple) and slicing the beets, there's very little prep involved with this dish. Note: if “spatchcock” is a new concept to you, don't be intimidated! It's a simple preparation that requires just THREE cuts in order to have the hen lay flat. We then sneak some butter under the skin, season, and bake until perfection! To spatchcock the hens, using sharp kitchen or butchering scissors to cut out the spine of the bird. Insert the scissors at the top of the cavity and cut along one side of the spine, separating it from the rest of the back. Repeat for the other side and discard the spine. With the bird breast side-down on the cutting board, press the back apart so it lays as flat as possible. Using a sharp knife, score the sternum between the breast. Once scored, press down with your hands on each breast so that the bird lays even more flat. Repeat for the other hen. Toss the brussels sprouts and beets with 2 tablespoons of the olive oil. Spread them out in a rimmed baking sheet then sprinkle the top with 1 teaspoon fine sea salt and a sprinkling of black pepper. To season the hens, work half of the butter under the skin (but over the muscle) on the breast and leg. Repeat for the other hen. Rub the top of each bird with the remaining olive oil. Sprinkle with the rest of the sea salt, garlic powder, pepper, and fresh rosemary. Place the flattened (spatchcock) hens on top of the vegetables breast side-up. Bake at 375 for 50 minutes, or until the tops of the hens are starting to turn golden brown. Let rest for about 5 minutes, garnish with additional rosemary (if desired), and enjoy! I have been married 11years, our tree has been a slow process. When my husband and I got married we were 19, he just joined the army, we had no money we didn’t even have a tree of our own for a few years because we would go home to my grandmas. When we got our first tree we had the cheapy Walmart decorations too, but then we moved overseas and I added ornaments I got from Italy and Germany. When we came back to the states my mom gave me ornaments I used as a child and every year I add one more ornament. My children are 10 and 4, there is no perfect tree, but it’s perfect for us!